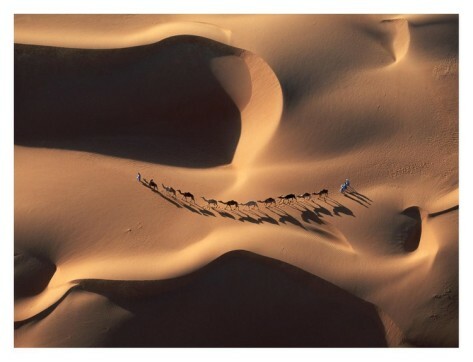 Train, Bus, Tram, or Camel? We get a lot of conversations in our comments that boil down to expressions of preference for particular Transit modes depending on people’s experiences and values. Those who are most concerned about the cost of infrastructure tend to favour buses, and those who value the qualities that rail offers feel the generally higher capital costs are justified. Often these exchanges do little to shift people from their starting positions because it’s a matter of two different issues talking passed each other; it’s all: ‘but look at the savings’ versus ‘but look at the quality’. And as it is generally agreed that Auckland needs to upgrade its Transit capabilities substantially I thought it might be a good time to pull back from the ‘mode wars’ with a little cool headed analysis. Because, as we shall see, it really isn’t that simple. It is possible to achieve almost all of what rail fans value with a bus, but only if you are willing to spend a rail-sized amount on building the route. Or alternatively you can build a system that has many of the disadvantages of buses in traffic but with a vehicle that runs on rails. It’s all about the corridor. Let’s see how…. Above is a chart from chapter 8 of Jarret Walker’s book Human Transit and illustrates Professor Vukan Vuchic’s classification of Transit ‘Running Ways’ or Right Of Way [ROW]. Class A ROW means that the vehicles are separate from any interruptions in their movement so are only delayed when stopping at their own stations as part of their service. In Auckland this is type of infrastructure is classified as the Rapid Transit Network [RTN], and currently is only available to the rail system plus the Northern Busway. So the speed of this service is only limited by the spacing and number of the stops, the dwell time at each stop, and the performance capabilities of the vehicle and system [especially acceleration]. Class B is a system where the vehicle is not strictly on its own ROW but does have forms of privilege compared to the other traffic, such as special lanes and priority at signals. Buses in buslanes are our local example. AT are currently building an ambitious city wide Class B network called the Frequent Transit Network FTN. Class C is just any Transit vehicle in general traffic. In Auckland that means most buses and the Wynyard Quarter Tram. The buses on the Local Transit Network LTN are our Class C service. And of course in terms of cost to build these classes it also goes bottom to top; lower to higher cost. And in general it costs more to lay track and buy trains than not, so also left to right, lower to higher. There can be an exception to these rules as with regard to Class A, especially if tunnels and bridges are required as rail uses a narrower corridor and require less ventilation than buses in these environments. Also it should be noted that a bigger electric vehicles on high volume routes are cheaper to operate too, so rail at higher volumes can be cheaper to run than buses over time because of lower fuel costs and fewer staff. There are also subtleties within these classifications, some of the things that slow down Class C services provide advantages that the greater speed of Class A design doesn’t. Class C typically offers more coverage, stopping more frequently taking riders right to the front door of their destinations. Class B often tries to achieve something in between the convenience of C while still getting closer to the speed of A. Sometimes however, especially if the priority is intermittent or the route planning poor, Class B can simply achieve the worst of both worlds! There are other considerations too, frequency is really a great asset to a service, as is provides real flexibility and freedom for the customer to arrange their affairs without ever having to fit in with the Transit provider’s plans. And as a rule the closer the classification is to the beginning of the alphabet the higher the frequency should be. Essentially a service isn’t really Class A if it doesn’t have a high frequency. Then there are other issues of comfort, design, and culture as expressed in the vehicles but also in the whole network that are not insignificant, although will generally do little to make up for poor service design no mater how high these values may be. And these can be fairly subjective too. For example I have a preference for museum pieces to be in, well, museums, but there are plenty of others who like their trams for example to be 50 years old. Design anyway is a holistic discipline, it is not just about appearance; a brilliantly efficient and well performing system is a beautiful thing. Other concerns include environmental factors, especially emissions and propulsion systems. On these counts currently in Auckland the trains and the buses are generally as bad as each other, both being largely old and worn out carcinogen producing diesel units. This is the one point that the little heritage tourist tram at Wynyard is a head of the pack. The newer buses are an improvement, I’m sure this fact has much to do with the success of the Link services, despite them remaining fairly poor Class C services. So in summary the extent to which a Transit service is free from other traffic has a huge influence on its appeal whatever the kit. A highly separated service is likely to be faster than alternatives, is more able to keep to its schedule reliably, and offer a smoother ride. These factors in turn lead to higher demand so the route will be able able to justify higher frequency, upgraded stations, newer vehicles and so on. This one factor, all else being equal, will lead to positive feedbacks for the service and network as a whole. Currently Auckland has a core RTN service of the Rail Network and the Northern Busway forming our only Class A services. So how do they stack up? The trains only run at RTN frequency on the week day peaks, and even then aspects of the route, especially on the Western Line undermine this classification. The Newmarket deviation and the closeness of the stations out West make this route a very dubious candidate for Class A. At least like all rail services is doesn’t ever give way to other traffic. The Onehunga line needs doubling or at least a passing section to improve frequencies. Unlike the Northern Busway services, which are as we know only on Class A ROW 41% of the time. So while the frequency is much better on the busway than the trains they drop right down to Class C on the bridge and in the city. 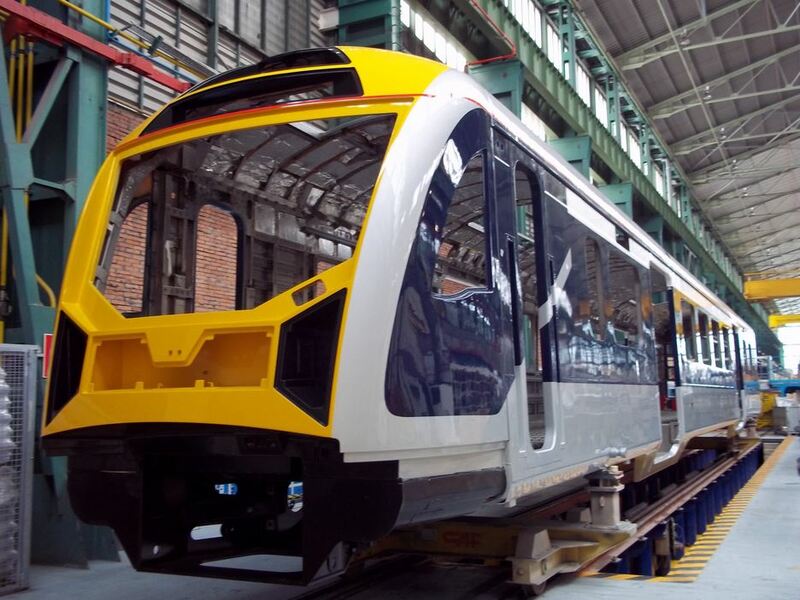 Of course over the next couple of years the trains are going to improve in an enormous leap and importantly not just in appearance, comfort, noise and fumes [plus lower running cost], but importantly in frequency and reliability. A real Class A service pattern of 10 min frequencies all day all week is planned [except the O-Line]. Hand won improvements to the network and service were built on the back of the brave plan to run second hand old trains on the existing network and have led directly to AK getting these beauties soon. But how about the rest of the RTN; the Northern Busway? Shouldn’t it be a matter of urgency to extend Class A properties to the rest of this already highly successful service? -extend the busway north with new stations- that’s planned. -improve the vehicles in order to up the capacity, appeal, and efficiency- that’s happening too with double deckers. I will turn to looking at where we can most effectively expand the Class A RTN network to in a following post. But now I just want to return briefly to look at what these classifications help us understand about other things we may want for our city. 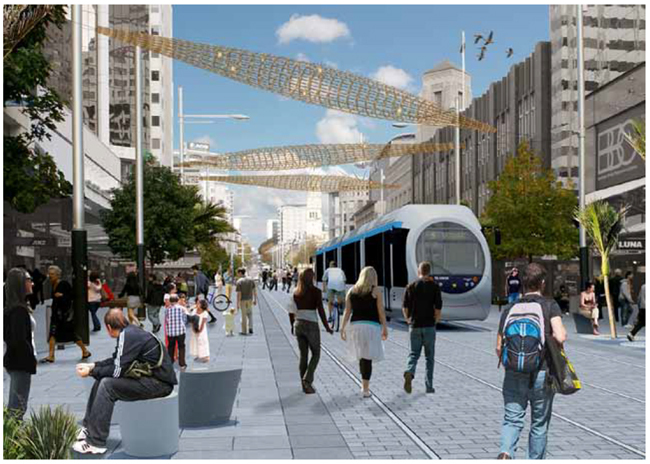 Below is an image produced by the Council of a possible future for Queen St. Much reaction to this image, positive and negative, has been focussed on the vehicle in the middle. The Tram, or Light Rail Transit. Beautiful thing or frightening cost; either way the improvement to the place is not dependant on this bit of kit. My view is that we should focus on the corridor instead, work towards making Queen St work first as a dedicated Transit and pedestrian place with our existing technology, buses, which will then build the need, or desirability, of upgrading the machines to something better. Why? because it is the quality of the corridor that provides the greater movement benefit, and with that benefit banked we will then have the demand to focus more urgently on other choices for this route. Furthermore, because of the significantly higher cost of adding a new transit system by postponing that option we able be able to get the first part done sooner or at all. And because we are now getting auto-dependency proponents claiming to support more investment in buses [yes Cameron Brewer* that’s you] we have an opportunity to call their bluff and get funding for some great Transit corridors by using their disingenuous mode focus. And thereby greatly improve the city. So it is best that we don’t focus so much on the number of humps on the beast, but rather on the route it will use. The flasher animal will follow. * These types don’t really support buses at all; they just pretend to support buses because when they say bus they mean road and when they mean road they mean car. How can we know this? Because they attack bus priority measures. But it is very encouraging that they now find themselves having to even pretend to see the need for Transit in Auckland. This is new. …..and what about cycling? It would be relatively cheap and quick to implement a dedicated network of cycleways, but again appears nowhere on the radar. Dave cycling, walking, and flying are all important but just outside the topic of this post. You are right, to do this would cost less than one motorway interchange…. why don’t the politicians get this message? Beyond me. There is a plan, and a couple of exciting projects; Skypath and Grafton Gully that will plug a couple of big holes over the next few years. We do cover these topics. That’s not what I have heard Pete when it comes to sections of Fanshawe & Sturdee streets. I have heard they lead to huge delays, especially for inbound buses. Others on this blog have said it can take as long to get from leaving the NBW to Britomart as it does to get from Constellation Dr to leaving the NBW. Those are not trivial delays. Your observation certainly doesn’t fit with my own observation of traffic through the bottom of town, particularly the leg from Nelson St to Britomart where it can be multiple light cycles before anything moves and there are no bus lanes. Then others obviously don’t use the busway everyday. Inbound it is VERY slow Albany To Constellation, very quick all the way to CUSTOMS ST and then slow from there. Fanshawe is class B, customs in C.
Outbound it is VERY slow to the bridge, reasonably quick over the bridge, slow at Akoranga, very fast to constellation and slow to Albany. The biggest easiest bottleneck to solve is Albany to Constellation as it is by far the slowest section, and the majority of passengers are already on the bus. Past that a lane on customs street, and then a 2 way between Akoranga and the bridge, then lanes across the Harbour (2030 as part of AWHC). Would definitely second this – weakest link of the NBW is Constellation to Albany. EXCEPT that the weakest link of the SYSTEM is getting to/from the bus stations. I know it’s been mentioned on this blog several times before but if we had introduced a proper feeder system when the Busway opened it would have been much more transformational and we wouldn’t be seeing the need to expand car parking at Albany (and that was really effective wasn’t it – the P&R is unofficially creeping out to engulf the whole of Albany), or having to defend bus lanes against their opponents, and the case for a Northwestern Busway would be irresistible. Unfortunately, I think the opportunity has gone. As for feeders, that is all planned, see the map linked to in the body of the article above, but sadly this is a slow process. There is consultation with the public, who tend to be fearful of change, and there are the private bus cos to get on board. This is not easy, especially on the Shore it would appear. Integrated ticking is proceeding, but, ideally we need the integrated fares first too, the zone system, for transfers from feeders to really work. *SB: 2030 Rail: Takapuna-Akoranga-Wynyard-Aotea- No road crossing. Thanks for your response Patrick by the way the plan that I quote for the bus lanes over the harbour is the NZTA preferred solution which is used on this blog to source info regarding the AWHC it won’t be quite class all the way, but it will be a minimum of B.
Hi all, I am writing this from my seat on a bus inbound to the city from the northern busway. In my experience getting onto the harbour bridge from the bus way is relatively pain free (am only) experience even at peak times. Once you hit fanshawe momentum definitely does slow, particularly around britomart. I believe this could be improved. Is it slow due to the priority or the stop spacing though. Not everyone goes to britomart. Excellent post as always, Patrick. That picture of Queen Street prompts this thought: already the place has improved hugely from what was there before, and the traffic has consquently dropped away so far it seems now a very easy step to get rid of it altogether. Of course the shopkeepers will no doubt protest, thinking as they do that Mrs Jones from Remmers drops into Smith & Caughey by car to pick up her haberdashery. Anyhooo … Perhaps the time has come to rethink the priority given to pedestrians in the street – NOT abolish the fantastic double-phased traffic lights, but inrease the priority to the City Link services. This could simply involve having the buses’ GPS trigger the green phases as they approach. At present the transit Queen Street slower than walking speed. Speeding them up would allow the frehquency to be increased too, without having to increase the number of buses on the run At many times they are packed. Absolutely right, Linz, traffic has declined in Queen St and why wouldn’t it, there is no vehicle destination in the street itself, except for deliveries, and these could easily be time limited. Wouldn’t permanent bus lanes be an easy first step? There are after all four lanes each way. I would like to see fewer turning options too at intersections as this would speed cycles for all users. But really let’s just close each block for general traffic (deliveries, emergency, and buses excepted). Leaving the east west street to be redesigned for buses and cars. Not confident that the Victoria St linear park idea can take the whole road width, we’ll still probably need buses there. Yesterday before an exhibition opening (and the careers night!) I had a drink in the corner bar of De Bretts and watched the huge number of people crossing the bottom of Shortland St and it seems obvious that this could be such a vibrant and wonderful place if the traffic was no longer being dragged down the hill by Queen St. Just close it to cars and extend the shared space benefit up all of High St. Lets just build a bunch of planter boxes and drop them off there one night. Pretty much every person you suggest the idea, of closing Queen St to agrees, so why is it not happening? Tune in to Parliament TV sometime and, if you are lucky, you may see my former wood work teacher, our illustrious Minister of Transport. About 5 mins into any of his speeches on transport, I think you will have your answer. Don’t want to be argumentative, but it would be the councils job to pedestrianise queen st. Patrick is so very right. By focusing on the corridor, it could be done tomorrow. Yeah, and a lá Lerner, how about LB does it the morning after he is voted back in…. that would lay down a gauntlet nicely. If anyone is keen to do the planters at any stage, even for a single block I am good with tools and willing to offer any help. Even just Customs to Shortland would be nice for now. It really needs to be Victoria to Customs in a oner. Wyndam, Fort, and Shortland barriered and Customs and Victoria policed [letting through buses, deliveries, and emergency] and taxis? and we’re away. Durham Lane and it’s gazillion carparking building spaces will just have to be served from Albert, or and soon enough make its ground floor ones repurposed into shops. Who is Len Brown’s brain these days? Oh and pedestrianising queen st, the problem is that queen st has just been made over and I doubt the council want to open that hornets nest again. The original consultation idea was for a queen st of one lane each way, no parking, and no indented bus bays. I.e a bus transit mall that didn’t explicitly ban traffic by design but probably would have in practice. Cue the inevitable bleating from shop owners and the remmers crowd and we got a four lane highway with carparking eating into the footpath instead. Perhaps in a couple of years when there are more shared spaces and they are undeniably successful. Just slowly remove thecarparks maybe? The parks seem to be in groups of 3 so we could just remove one group, then the next, then the next and that will show that no one ever parked there to use Queen Street anyway. Also one way to remove traffic is to make it really, really slow and hence so unattractive for driving that it is basically empty. I’ve got power tools and a big garage to store a reasonable number of planters until needed. We’ve got a few months to build them before the election :-). Now we just need a timber sponsor. I can get wood at trade rates, but it’s still a fair bit, soil and plants should be reasonably cheap. Maybe we should be talking to Ludo Campbell-Reid for guidance? The proposal for the Victoria St linear park isn’t to take the whole street width anyway, only the (sunnier) southern half or so. There will still be need for some traffic lanes there, but one lane each way with turn bays where appropriate would allow for a quite high capacity roadway with minimal road space or impact on the park. Personally I think it is better to not have buses at all on Victoria, trying to squeeze buses, linear park, general crosstown traffic and local access into half the road would be a very class C outcome for buses. Rather put them all somewhere they can have class B bus lanes, and signal priority and good sized stops, and leave Victoria to be a pedestrian and cycle prioritised space with reasonable traffic capacity. The problem with this post is that it fails to recognise that PT is necessarily a network or system and that system is there to serve the needs of PEOPLE. People are your starting point and the fundamental unit of planning, not trains, not buses, not trams or even camels. So the question should be how do we best meet the travel needs of people living in Auckland now and in the future? Part of the answer is rail, part of it is bus, but the whole of it is rail and bus each working to their particular strengths. Fixed, infrastructure dependent PT (Class A rail and Class C trolleybus) have little or no route flexibility and can only serve the areas adjacent to their route (and they can do that very well). 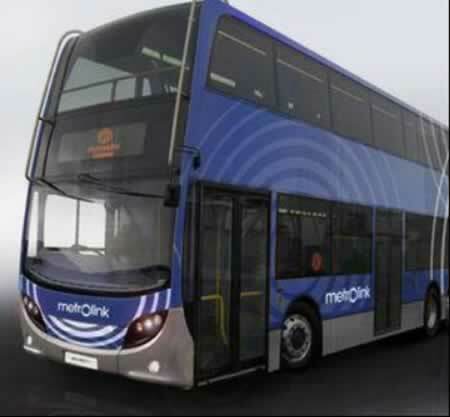 Buses are more flexible and are dependent only on roads so they’re strong as feeders to (and users of) Class A from suburban streets and as main transport providers to employment and commercial centres on routes not served by Class A. To do this latter role well, we need a lot more Class B. A couple of factual points, Fanshawe St bus lanes are 24/7 and have been for several years (a simple check on Streetview can confirm this) and contrary to your assertion, the majority of buses in service are not old and worn out, but vehicles on contracted services have needed to comply with minimum age and quality standards at least since ARC days and the majority of buses on scheduled route services will comply with at least Euro 4 or 5. You haven’t spent much time south of the Harbour Bridge, maybe? The vast majority of NZ Bus’ fleet is at least a decade old, before Euro4 (introduced 2005), and there are more than a few buses out there that have licence plates in the P series (very early 1990s). The bendy buses are all in the K series, and my first car was a KA series plate built in Auckland in 1981 so that gives you a pretty good idea of their geriatric condition. There are a lot of very old buses in service in this city, and one only needs to look at what comes through from South Auckland to see that. There are definitely buses on the streets that are more than 20 years old, and I don’t just mean the bendies. One only needs to go along Great South Road outside Dilworth and look at the row of parked buses to see some real dinosaurs. 20 years is also pretty damned old for a bus that’s running scheduled services daily in Auckland. I concur last night on the buses south of the bridge. I was on a dog of an old NZ Bus on the 625 (Remuera Road) route last night and it was at least 20 years old (it was so old, it was just a “Fairfax” model!. – so thats two that are way over the used by limit. To be fair, however a couple of buses I rode in the other day in the AM peak were new, as they had the slide-on-the-outside rear doors so they were definitely much newer (but actually the bus internals were crappier if that could be the case). Yes, I walk along Gt South Road outside Dilworth Boys School too sometimes and thats where the old school run buses go to cough, wheeze and take a well earned rest between AM and PM peak school runs. There are some real dogs parked there – some are so old, they’re even in the old Stagecoach colours still and how long ago was that in use? Oh, there are absolutely new buses in the fleet on this side of the Bridge, and their numbers are increasing, but they are certainly not the only buses on the road. Both H&E and NZ Bus appear to be going through a renewal cycle at present because they’ve got some very, very new buses on the road (have seen a few Gxx series plates on buses lately, and those have only been on issue since last year), but it will be a long time before all the dungers have been sent to the big bus depot in the sky (or the Pacific Islands). Something has to be done about the bendies, too. We can’t just say “replace them with double-deckers”, either, because the bendies can go along any road corridor that doesn’t have too-tight corners whereas the double-deckers need every cm of the 4.25m maximum legal height. The bendies are an embarrassment, not to mention horribly polluting. Nobody’s debating that. You were the one who tried to argue that the bus fleet isn’t old and worn-out, I was merely correcting your North Shore misunderstanding of what life is like south of the Bridge. Matt, all we’ve shown is that we’re both wrong and that the quality of Auckland’s bus fleet (and the Shore is still part of Auckland last time I looked) is clearly variable, or perceived as such. Yes it is variable, but improving. But only improving incrementally, in that despite hopes and boosting articles electric buses seem to be always coming but never quite arriving…. that’s the step change that I’m waiting for. I always hear this about buses being so flexible but I think this is just extrapolating that buses are somehow like cars because they have wheels. But how often do bus routes change? Timetables might but then so do train timetables. The routes are changing from 2016 to the RTN but that has been years in the consultation process. Routes dont change a lot, thank goodness or noone would use them as you could never be sure whether there will still be a bus. And what about the busways? We cant just up and move them very quickly. Look at the fixed infrastructure around Akoranga station. Buses, like all transport, work best on their own ROW and that ROW is not that flexible. Anyway, PT with its own ROW is so powerful that it shapes the city around it. You get clusters of housing and mixed use development that mean the rail/busway stations become more and more important. You can see this all over the world where PT operates on its own ROW. So it isnt just about serving the existing areas of Auckland, it will reshape the city to make it work better and more efficiently so people dont need to drive everywhere or at least not as far. Sure bus routings change, and get added as areas grow, but what does this actually mean for this concept of flexibility. In particular, how often does a section of road that has a bus route on it stop having a bus route on it? Go back to the old tram network and you will find almost identical bus routes today. Even look at the new RPTP network, a totally and complete blank slate overhaul of the network design and routines. But how many streets that currently have buses will not har buses under the new network. You could count them on one hand. And how many streets that don’t have buses now are getting them. You could count those on the other hand. Ben, I agree that LRT would be better up Queen [and all the way up Dominion too] but the main thrust of the post is that the way to get that [or other preferred vehicles] is to work better with the ones we’ve got. Maybe I didn’t spell it out clearly but I’m making a suggestion about tactics in Transit advocacy as much as anything. As well as showing, I hope, that we can get a lot of improvement sooner this way too…. Buses are not less safe than Trams. They can stop faster, and on their own right of way they have no need for sudden deviations (other than to avoid running someone over. It is probably true that peds are less careful around trams, but that isn’t necessarily a good thing. During my time living in Manchester, there were frequent reports of tram/ped accidents. Last time I was in Melbourne there was a big ad campaign warning pedestrians of the danger of trams. By your own definitions the bus lanes supporting the Northern Busway through the CBD are NOT Class corridors, they are Class B corridors and as you have commented “Class B can simply achieve the worst of both worlds!”. The Class A solution to the Northern Busway is a CBD bus tunnel which is not happening . . . so the Northern Busway is probably close to as good as it can get in the corridor terms you have rightly outlined. Forgive my ignorance Tony, but wouldn’t the Class A solution to the Northern Busway be bus lanes on the bridge and Fanshawe St? Which I think Patrick points out in his post. Constructing a CBD bus tunnel seems like an extreme fix and would come at a huge cost compared with painting some car lanes green. 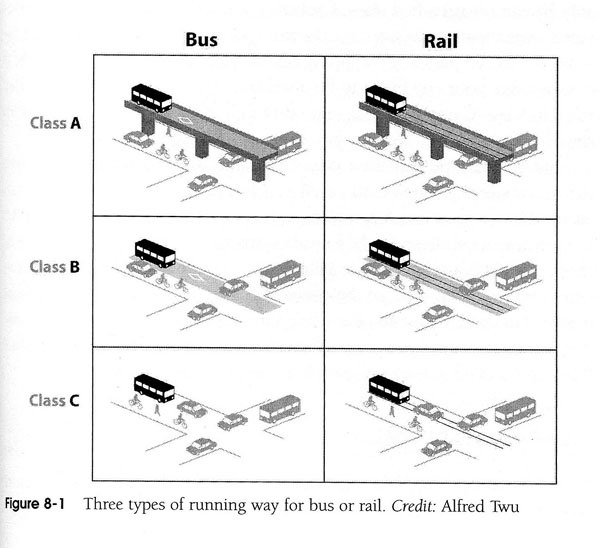 No, class A is a fully separated right-of-way. Bus lanes on the Bridge would be class B, still vulnerable to interference from other vehicles on the Bridge (there’s no space to install a hard divider). What we don’t have at present is even a class B corridor all the way from the Harbour Bridge to Britomart in both directions. Well, the way to install a hard divider would be turning the southbound clip-on into a two way busway. Tony you are right, but A is not always best and the improvement from C to B will be huge, and done properly, priority signalling and stations so will really be a kind of B+. Way more possible sooner and way cheaper than bus tunnels. Furthermore more like the best of both worlds because by still having the buses on the streets takes the riders to the front door of their destinations not into some nasty diesel fumed cave under the city. A vital and nearterm reachable improvement in my book, and considerably preferable to expensive and unpleasant bus tunnels. Forgive me if I have missed something, but from Nate B s bus experience, and commen sense. What outcome would a designated lane on the bridge for busses achieve? There is more down stream capacity once over the bridge and busses never delayed. The issues are on the local road network. What you have missed is that I do call for improved priority on the local roads. And theory is essential if we are to properly understand the choices in front of us. What would be ‘silly’ would be to be making ill informed and disconnected decisions without recourse to understanding of the likely outcomes. Hey ‘Sweet as’ – just a note, given this is a transport blog, the plural of ‘bus’ is ‘buses’ not ‘busses’… nothing personal, y’understand. I think what you have missed Patrick, and you seem to do a nice line in deliberate misrepresentation of people’s positions, is that I was following on the general debate, not referencing the original article. Well thought out ( your original opening statement ) but despite you claiming you are type transport neutral you come back to the train bus devide when clearly the issue is about efficiency of each mode of transport. ( please note you made no reference to walking, cycling or ferrys and no I dont care about the plural of ferry Ben or the correct grammatical use of the word ferry’s ) . So I think your point is that we should use the most efficient transport whatever that is for the particular need.. We need a definition of efficient (subjective ) and then move on to case studies. I do not think we can then argue about the logic of that. People also live on major roads so quality of life is an issue for those who cannot afford to move. So the issues are noise/pollution/capacity/flexibility/time. The problem is to find a solution and often we do not look for the solutions outside of the existing paradigms. Eg promoting work from home/ encouraging work and schooling in your neighbor hood/ promoting electric buses/mini vans/ better feeder systems to trains and ferries / glide time / jobshare/ on line shopping etc etc. All have a part to play to reduce demand at peak times or make peoples environments more pleasant. The question that should be asked is why are people travelling……… Jobs, schools, shopping, visiting friends, and how can we reduce the peaks and numbers of journeys. I personally do not have a problem travelling around because I avoid peaks. But that is because I am self employed and I can plan my time. The roads off peak have plenty of capacity and I can use my car to go any where. However most do not have the flexibiilty so is flexibility the question ??? Why do so many people travel so far to work or school …..lack of choice ????? Thanks Robert and others for your views. I think I do need to point out that this is just one of many thousands of posts on this site and as such it sets out to unpack just one particular transport issue with an Auckland focus, and like the other posts here it doesn’t claim to address every problem that our city faces. Here, as the opening paragraph clearly states, the aim is to open up the Transit vehicle mode debate a little. The Active modes; walking and cycling, are another matter and are not covered here because of that- not because they aren’t important. My main transport mode is cycling but that doesn’t mean I have to discuss cycling in all posts. Ferries too are outside of this debate, they clearly have a pretty singular ROW that is not generally interchangeable with land vehicles, and they face other very particular issues which are discussed elsewhere and i’m sure will be addressed again. We have learnt that it is best to chase one central idea with each post, not only in order to keep the length under control and to enable a bit of drilling down, but also to hopefully focus the comment stream onto one topic area. So while expanding the topic direction in the comments is absolutely fine complaining that the post doesn’t discuss something it didn’t set out to address is a little odd. I think a lot of people also forget the place part of public transit when they discuss this and it goes both ways. Trams and buses tend to breed particular urban spaces Queen Street Dominion Road and Ponsonby Road are places where trams would improve the sense of place, Fanshawe Street is about movement and less about place so a bus may well be appropriate. Rather than talking about the as a whole system we need to talk about what each place need as well as which movements need to be supported through a place. Looking at the small and thhe big to decide the small, rather than looking at the small to decide the small and the large. You are bang on Sailor Boy, agree 100%. It would be crazy to put trams everywhere as yes flexibility is there, though I still question the extent of that. However, the places you listed will always be popular. There is almost no chance that Ponsonby Road, Queen Street or Dominion Road will become unimportant and so putting in a fixed ROW for a tram will always pay dividends and increase the value of those areas. I always thought a tram from Newmarket down Khyber Pass Road and then up Ponsonby Road would be fantastic. Then, post CRL, it would also link with the new Newton station allowing easy access across the city. That is proposed in the auckland plan for late 2020’s I think. That would probably be the next project in my opinion after those 3, unless we decide to do something in a Metcentre instead (Albany station to Massey Unversity?) or Takapuna-Milford via Smales Farm. The trouble with trams is that it has to be on a high use corridor and run the whole way through all routes along that corridor unless the corridir is massively wide. Hence why Queen St to Dominion road is ideal. The whole thing is either MtRoskill to the city, or city link. Any buses from further out can use Sandringham road, and Ian Mckinnon is so big that a tramline andparalell buses won’t matter. The reasons listed above also explain my lack of interest in a Tamaki Drive tram, basically I don’t think we can get it all the way to St Heliers, and I don’t think it is fair to ask people to change froma bus to a tram on the same road. You may well be right on Tamaki Drive, at least in the short to medium term. It would be such a great expereince to have ion there though. I cycled from the CBD to Mission Bay a few weeks ago and it really struck me what a wasted zone that is. I hope at least we could increase the off road cycle paths so that children and the elderly feel they can bike that route. The space is there, we just need to reprioritise how we use it. I dont believe car parks all the way along Tamaki Drive is the best use of such a superb vista. I think Cnotra flow is probably the way to go on tamaki drive, with a full lane or more of width. Bike is the mode for improvement on Tamaki Drive I reckon, that means proper unbroken and not shared with pedestrians. I agree that it would be nice to stay on track but I do find the one dimensional theories rather boring. I thought your aim was to look at the broader issues theoretically. Given that so much money is misdirected looking at the whole problem from a broader perspective ie why we travel may have lead to some refreshing insights from the contributers. Given we are now talking about bikes are we now not way off topic that seems odd to me??? Yes, we should really get back to the normal one dimensional discussion in Auckland on transport: cars, cars and more cars. Right? Robert you can have width or depth in a blog post, with a book you could both. If that is more to your taste can I recommend Jarret Walkers Human Transit. If you really feel we are missing something important how about submitting a gust post. Show us how to do it! Patrick, while there may be some merit in your hypothesis I think its theoretical nature might remain its only strength. Esp. with regard to your Q St example it seems informed by a slightly defeatist approach – that we need to creep sideways towards making Q St a quality corridor and then the old switcharoo from buses to (what I think you’re tacitly supporting) light rail. Who’s to say you don’t just end up with a river of diesel buses choking up our supposed main street? It’s an upward move. If you hadn’t noticed Queen St currently has four lanes of general traffic, plus indented parkIng bays. So who wants to share Queen St with dedicated bus lanes? Me! Two lanes just for buses would be a vast improvement over four mixed lanes plus parking. Three quarters of the road width for pedestrians and an excellent urban environment, one quarter for class B passenger transit, and not a traffic jam in sight. Only one step shy of a Bourke St style tram mall, but critically, something that could be achieved in say three months time. No politicking over light rail and vehicle orders and funding issues. If they can fund the streetscape changes (which could be as simple as paint, planter boxes and signal reprogramming) the buses can continue to run up and down the street and immediately benefit from operational cost savings and increased reliability. That makes the case for light rail as the next stage all the more strong. Don’t let the perfect be the enemy of the good, or in this case don’t say you must go immediately to the final outcome or do nothing at all. That is simply not how local government operates. As for your nose to tail concerns, on a two lane bus only corridor with reasonable signal priority you would be looking at around 100 buses an hour before you get the Oxford St situation. Currently the city link maxes out at around 15 buses during the busiest hour from what I can gather. You have nothing to worry about. Anyway let’s say it’s worth a trial at least – because as you say it could be done with relatively little outlay and effort. But what about this for a random idea: Q St almost fully pedestrianised with just ONE marked bus lane. Which carries buses in BOTH directions. Only this is a bus lane with multiple passing bays (long enough for say two buses). So the buses are forced to progress carefully. The passing bays can of course also function as bus stops. In rush hour the directional frequency of multiple buses would give them natural right of way priority/superiority. I’m not thinking such a bus lane is grade separated, it’s just where they’re supposed to go. In the event of a problem they can still pass left and right of each other as normal but the expectation is they stay in the marked corridor unless it’s extraordinary circumstances. What about just have the drivers go slowly up Q St? Make it 25k an hour, and train them to be smooth and predictable. Presumably you would have to give tram drivers similar training in any case. That would be fine as speed limit on Queen St is 30km/h already, and top speed has little relevance to bus operations in that environment. The issue is how much time the buses spend stopped, not the top speed they reach when they are moving. A single lane with passing loops would probably be fine, but I’m not quite sold on the value of saving 3.5m for the second lane on roughly half the alignment. Each intersection, stop and lights would need both lanes I think. In any case, slow and measured bus driving wouldn’t really affect the speed of operations half as much as existing traffic and signal phasings. How does the vehicle type have such an effect on people’s mode choice? Most people I talk to base their travel choices on two variables: time and cost.. What you are proposing would keep the former constant whilst significantly increasing the latter (unless you intend for non-users to significantly subsidise your tram system). In which case it will be less, not more attractive. I think Patrick is on the money. Lets pick the low hanging fruit now, and then we can decide on the gold plating later. Rail can have very favorable cost-per-user advantages under certain conditions, I.e where you have very high volumes on the same corridor. Consider a demand of 5,000 pax per hour. That’s something like six trains, thirty trams, seventy double deckers or one hundred and twenty regular buses. There are obvious cost differences there, but only where the patronage is high. Where it is low, you have the choice of very low service frequency, or incredibly high costs per passenger. There are a few niches where we could probably justify paying for the ‘look and feel’ of rail, say trams on Queen St, but in most cases you would need a convincing argument bases on demand and operating cost per passenger-km. An easy change to speed up the Northern Bus Way would be to change the T2 on ramp at Greveille Rd to a T3. When I am there at 0635 the bus is held up as T2 traffic merge into the motorway. The empty bus lane beckons about 40 metres way whilst one car S L O W L Y merges. Adds 30-60 seconds at 0635 so imagine is a lot worse by 0700. Its awful at 7, trust me, the best way would be a wall between the T2 and the bus lane such that merging never became an issue. Not correct for class C. It costs more to build grade-separated busways than grade-separated railways, very consistently. This is largely because you need more width for a busway (since the buses aren’t on rails), and you need to pour more concrete (rather than supporting only the tracks, you have to support a bus driving anywhere on the roadbed). Yes, quite right. The CCFAS showed that the CRL is no more expensive than bus tunnels and considerably better. So a subtext of this post is to show that as you move up the classes rail based systems become increasingly cost competitive. There can be an exception to these rules as with regard to Class A, especially if tunnels and bridges are required as rail uses a narrower corridor and require less ventilation than buses in these environments. Also it should be noted that a bigger electric vehicles on high volume routes are cheaper to operate too, so rail at higher volumes can be cheaper to run than buses over time because of lower fuel costs and fewer staff. This is an interesting post. Transport Blog with your Class A network do you think getting that all to Class B (bus symbols in most places on a car lane) and up resourcing would assist with mode share first, change focus of public, then focus on Class A as what has AMETI acheived so far for any bus improvement?in 3 yrs construction.Isn’t it better to have widespread priority first and start turning this road building animal around. Class B with full priority and advance signal detection for no stopping must be a Class B plus? Logical progression of priority improvement over the whole network to 4 star then go busway or rail? as per programme. Stephen it is clear from the huge uptake of our Class A networks [currently 18% v 7%] that any investment in improving and extending this Rapid Transit part of our networks returns over the odds on the investment, so this should be the primary focus until it reaches much more of the city. This means AMETI, NW Busway, completion of Northern Busway, CRL, Mangere rail, Dom Rd/Queen St LRT etc… The CFN basically. However, at the same time, and for much less capital, clearly the New Bus Network needs continuos buslanes… I see no argument for pursuing one programme over the other: both are vital, and overdue. You are right both overdue. I can’t help think that if the delay for a full scale, not partial Class B network was the buses, why didn’t they just buy a whole fleet for 3 months congestion cost. I hope a congestion dollar total is clocking up on Davids and Lens desk. And the fight doesn’t start until class b with a high frequency focus of 400 buses on your 2030 plan. Then game on. Do we need to cut the trees on Gt Nth Rd with this in the model.